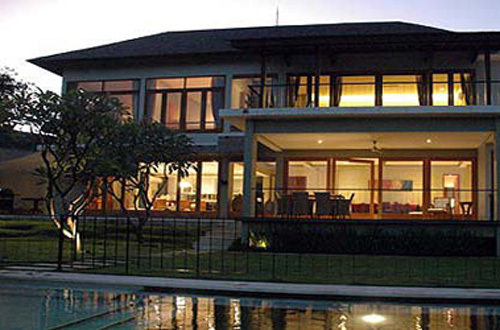 Casabelle Villa Location In Bukit Pecatu area , 35 minutes drive from airport. A two story villa overlooking woodland and ocean, Casabelle is an idyllic home away from home. Casabelle has 3 bedrooms inside the main building and a separate guest house with 2 bedrooms. The main building overlooks tropical gardens, a stunning infinity pool and deck. Casabelle is located on the Bukit and faces south over the Indian Ocean . You will feel a long way from the hustle and bustle of touristy areas, yet are only 35 minutes from the airport and 30 minutes from the main shopping and restaurant areas in Nusadua. Secluded beaches are only 10 minutes away where you can enjoy spectacular sunsets and stroll on white sand. An 18 hole championship golf course is 25 minutes away at Nusa Dua, while an 18 hole golf course, New Kuta Golf at the Pecatu Graha complex is only 5 minutes away. Casabelle is designed with young children in mind and the pool is fenced off. The Villa Manager, Adri who has studied abroad and is fluent in English, will supervise the in-house staff to ensure that your holiday is as relaxing as possible. On call spa services are available to refresh your body and soul. A car and driver are available on request to take you to the many destinations which Bali has to offer. Master Bedroom: Located on the second floor of the main building, this bedroom opens on to a spacious terrace with spectacular panoramic views over the woodland canopy and ocean. The terrace is a perfect hideaway to relax or enjoy massages with the sea breeze washing over you. The en-suite bathroom is a feature of the house with a walk-in wardrobe, a stand-alone bathtub and an outdoor shower, surrounded by spectacular views. An infinity salt water pool of 15 by 5 meters is flanked by a deck with sun-loungers which allow you to enjoy the spectacular views. Relax by the pool while staff cater to your needs. If you would like a massage or spa service let the staff know and well trained therapists can be booked and pamper you in the comfort of Casabelle. An in house cook can provide delicious meals from the fully equipped modern kitchen or the barbeque. You can either eat outside on the terrace or inside with air conditioning for more intimate gatherings. Food and beverages can be pre- requested from an in-house menu. In the TV Room, a large flat screened television shows all major international channels via satellite. There is also a DVD player with some of the latest movies. Next to it is a reading room which doubles as a childrens’ room which has a lot of games and toys for the younger guests. Guests can also request a baby cot, Maclaren stroller (suitable for babies up to 20 kg), Peg-Perego car seat (up to 18 kg) , baby monitors and Avent sterilizer. If you would like to tone up, you can visit the gym. This is equipped with a cross-trainer, free weights and bench with a full-length mirror. Alternatively you can take the villa bike if you would like to cycle round the surrounding area. Dreamland, Padang Padang, Batu Layah, Balangan, Jimbaran and Nusa Dua are the most famous beaches near Casabelle. The secluded white sandy beaches and surf breaks are well known amongst professional surfers. Families can enjoy strolling along the private beaches away from the crowds. Pack a picnic basket and work on your suntan, just make sure you always swim between the flags. Uluwatu temple is Bali ’s guardian of the south. This ancient temple is situated on the tip of the cliff where, at sunset each day, a magnificent Kecak Dance is held with more than a hundred male dancers, performing the Ramayana epic. Bali offers a wide variety of world class cuisine, all of which is easily accessible by car. The villa manager will provide details upon request.